Well, this has been a busy weekend for me. Saturday, I went to my very first Shoe Box Swap. It was FANTASTIC. I am so happy that Shelley invited me to attend. And actually, I was one of the hosts! :) Anyway, I made 20 amazing cards to send to people and got 5 hours away from my WHOLE FAMILY! Now, I love my family dearly, but having the opportunity to spend time with some of the most creative and nicest women in the entire world was so much fun. I cannot wait until my next swap! 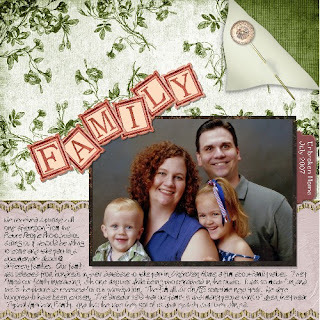 I have been busy working on Scrapbook Layouts for the Creative Team that I'm a part ofand some layouts to catch me up with my children's lives. Of course, that is near impossible since I have only scrapped about 10 pages of Cayden in all. Here are some of my recent LOs. Credits: Kit is Yesterday's Blush by CanDesigns. Tab from Holly Jolly by Jenna Robertson. Family Title is by Shalae Tippetts. And now for some exciting news. 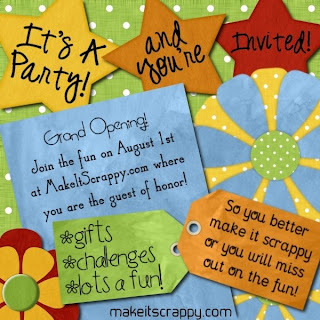 I have been chosen to be on Traci Thompson's Creative Team at Make It Scrappy. So to celebrate it's Grand Opening on August 1st, we're having a party!!! Here are the details!!!! I hope you'll join us for the fun and games. All who register in the month of August will receive a wonderful Freebie Collaboration Kit!!! We're all so very excited. Be sure to visit the Showroom and leave us some love! Credits: Kit is Fun Flowers by SwordaScrappin (Mollie Pepin). 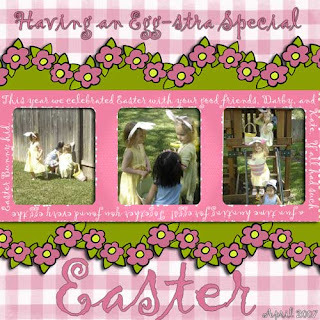 Template Hangin' Around the Third by Tracy Drane.Journaling:This year we celebrated Easter with your good friends, Darby and Kate. Y'all had such a fun time hunting for eggs. Together you found every egg the Easter Bunny hid.